Your business moves fast. It’s our job to be faster. FastSMT’s quick response manufacturing includes PRODUCTION VOLUMES. For over a decade, FastSMT has been offering Quick Turn PCB Assembly & Design Services for consigned material kits. Our standard turn time is two weeks, with 24, 48 and 72 hour delivery always available. We have now leveraged that capability to offer the same service to our turnkey customers. We can order and receive PCBs and stock material within three days, and build and deliver within FIVE DAYS. We also provide PCB layout and design services. 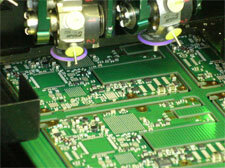 Look to FastSMT for all you quick turn printed circuit board assembly and design services.